Our friends at Gear Patrol posted this almost a year ago. Twelve months later, it’s still cool. Brave or stupid. Too close to call. This has absolutely nothing to do with overlanding. But, it is cool. Feeling academic? 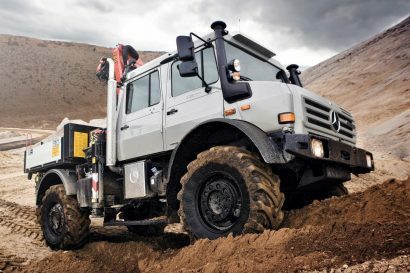 Want to learn about the history of the Unimog? Here’s your chance. I broke a sweat just watching this video. I don’t think I’d have the courage to do this. Surfers are a passionate, and dedicated lot. No challenge is too big to overcome in the name of a good set. This is a beautiful overlanding video. This is what adventure motorcycles were born to do. If you’re interesting in photography, you have to see this. These images were shot with almost 100 cameras per scene. If you think the images are amazing, you should see the work that goes into capturing them. They say this project started out with the simple plan to powder coat the swingarm, but it clearly went well beyond that. This video describes the process by which an already formidable KTM 950 became a beastly AWD monster. Iceland is just too beautiful. Paired to a Land Rover, it’s a tough combo to beat. Ever had a rough day? This video will put that in perspective. It’s important to note, the jumper in this video survived, albeit with multiple injuries including a compressed vertebra, oodles of stitches, and bruises. We wish him a speedy recovery.